'Tis the season, friends. You'll have many opportunities to shop Monsoon Pottery in Chicago this holiday season and we'll be creating special pieces that will be sold exclusively at our pop-ups. Check back regularly for updates! Kick off the shopping season with a holiday market that starts on Small Business Saturday and continues through Sunday. At the same market, shop Handmade by Michelle, Yarnies by Mikey both days, and Allison Mooney Design on Sunday only. We're super excited about this one. 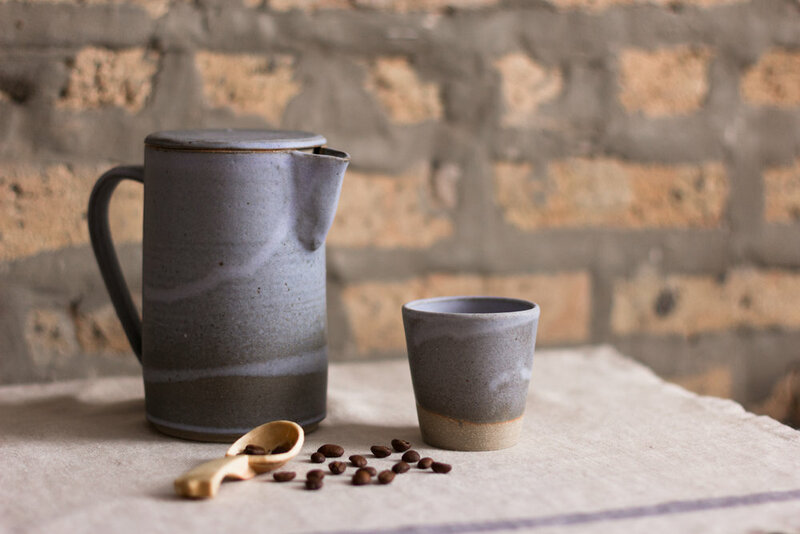 Shop Monsoon Pottery and over 120 vendors at one of Chicago's best holiday markets. Buy tickets for $10 in advance (or $12 at the door), of which $2.50 goes to The Kitchen Community, connecting Chicago kids through read food and Learning Gardens. Support a great cause and your local businesses in one highly curated food and fashion-focused event. One of our favorite retailers in Chicago is hosting us for their Small Business Saturday series. Come get your last-minute gifts and shop at our pals' pop-up, Lost Girl's Vintage. Jack and I created an exhibit for the StudioUs show that describes the making process at Monsoon Pottery. We're reprinting that exhibit here so everyone can get to know our process. Each piece at Monsoon Pottery is designed and handmade by Danielle Chutinthranond. We purchase prepared clays and wedge, throw, trim, glaze, and fire everything in our home studio. The most common question we hear is: “How long does it take to make something?” It depends. Clay takes a long time to dry and, during rainy weeks, even longer. We fire each piece twice and, including cooling times, each firing can take up to three days. Aside from these fluctuations in drying and firing times, our process can be summarized in these photographs. Wedging stoneware. Photograph by Jack Li. Wedging clay gives it a uniform texture and removes air bubbles. While tiny pockets of air may seem harmless, they can cause a piece to collapse on the wheel or, even worse, explode during a firing. We wedge every piece of clay at least 100 times. Throwing stoneware. Photograph by Jack Li. Wedged clay is centered on the wheel at high speed with plenty of water. Centering aligns the molecules of the clay to make the throwing process easier. Once centered, the clay is shaped into plates, bowls, cups, or vases. Finished pieces are left to dry until firm and barely damp to the touch (”leather hard”). This can take one day for small pieces or at least a week for plates. Trimming stoneware. Photograph by Jack Li. Trimming, or turning, is the process of refining and finishing the bottom of each piece. While the wheel is spinning, metal tools carve away excess clay and shape a foot. The piece is signed and left to dry completely, or until “bone dry;” a process that usually takes three days. Bisque fired porcelain. Photograph by Jack Li. Bone dry pieces are carefully loaded into the kiln and fired to cone 06, about 1850 degrees Fahrenheit. Reaching cone 06 takes between 7-10 hours and the kiln takes over a day to cool down. The bisque firing makes the pieces hard and porous, ideal for absorbing glaze. Glazed pots in the kiln before firing. Photograph by Jack Li. We mix all of our glazes at Monsoon Pottery. Most pieces are dipped into glaze after applying wax resist to areas that come in contact with the kiln shelf. The kiln is fired to cone 10, about 2350 degrees Fahrenheit, transforming the glaze and clay into the ceramic material you see in this gallery. The glazed pot from the previous photograph is transformed by the glaze firing into an object to be enjoyed for generations. Photograph by Jack Li. Making pottery involves careful planning, strength, patience, and relinquishing control. A single piece can take weeks to make, but we think it’s worth the wait. We have a holiday show this year! It starts October 10 and goes through the end of 2017. Join us at the opening reception on Friday, October 13th at StudioUs from 8-10pm. There will be a vinyl set from DJ Pompey and accompanist Keith Harris. This show coincides with Andersonville Arts Week. In addition to the objects at StudioUs, we will be decorating a tablescape at Guesthouse Hotel, just up the street, for Arts Week only (October 10-15). StudioUs offers year-round, weekly fine art classes for students age 4 and up. Andersonville's luxury home boutique hotel. The kiln came last week. FINALLY! It took three people and a pallet jack to get this 1100lb monster into my garage. I can't say how happy, excited, and relieved I am that it arrived and is in one piece. The saga continues, however--my electric still needs an upgrade. Send some positive vibes my way. I hope to have this baby up and running soon. Should I name it? In the meantime I'll still be firing and finishing work at Lillstreet. Look for a made to order option soon! Although my heart is cracked, it is not broken. I’m still in shock. Even though I voted I feel like I could have done more. Today was a wakeup call. It’s time to protect our progress. This old pot reminded me that while my heart is cracked, it’s not broken. I’m choosing a portfolio of charities to which a percentage of ALL Monsoon Pottery sales will go. So far I’m planning on giving to Planned Parenthood and the ACLU. I’m asking for your help in finding organizations that support (to start with): equal rights and opportunities for women and minorities; desegregation of schools; curiosity, empathy, and open-mindedness in youth; arts and music programs for low-income youth; and marriage equality for all. While we don’t know what will happen, I’m pledging to be a more active participant in our political process and the expression of my views. I’m sure I will lose followers and sales but I’m choosing to believe that fighting for what's right will be worth it. Use our contact form to tell me about your favorite worthy causes. It’s time to band together and protect the people we love. One day, I hope to look at this photo and remember with happiness that we put a huge crack in the glass ceiling. Thanks taking interest in my journey. I'm Danielle and I am the (only) person behind Monsoon Pottery. I'm building my home studio so I can produce more work for all of you. Stay tuned to the blog to keep updated on my progress. My first update is about my first piece of equipment--a slab roller. Most of my work is wheel thrown but I have a serious love for handbuilding. I wasn't planning on getting a slab roller, but I took it as a sign when Lillstreet priced this one to move. Getting this thing into my studio took the strength of three people and taking a door off its hinges--I think it weighs about a thousand pounds.